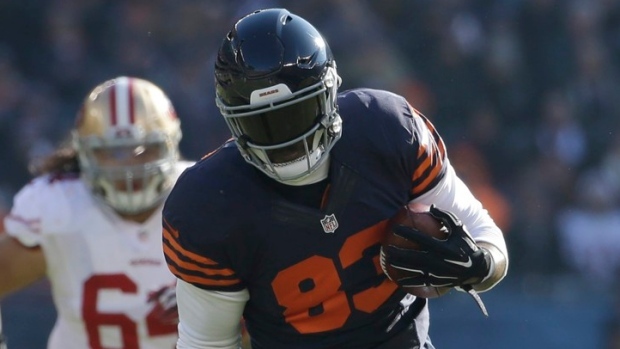 LAKE FOREST, Ill. - Chicago Bears tight end Martellus Bennett will miss the rest of the season because of a rib injury. The Bears placed Bennett on injured reserve Tuesday, ending his third season in Chicago and ninth in the NFL. With Bennett out, the Bears signed former Arizona and Cleveland tight end Rob Housler. They also announced that offensive tackle Tayo Fabuluje has been removed from the reserve/suspended by the commissioner list, but the team has a roster exemption for him. Chicago (5-7) hosts Washington this weekend. Bennett, the team leader with 53 catches, has been dealing with the rib injury the past few weeks. He missed the win at Green Bay on Thanksgiving and was limited during Chicago's overtime loss to San Francisco on Sunday. Bennett was shaken up early in the third quarter against the 49ers when he took a hit to the left side. He returned to the game and finished with three catches for 14 yards. While he leads the team in catches, Bennett has been a bit erratic this season with just 439 yards. The free-spirited tight end also missed optional off-season workouts — their first under coach John Fox — because he wanted a contract extension despite having two years remaining, forcing him to play catch-up in new offensive co-ordinator Adam Gase's system. The move to injured reserve comes at a time when there were already big questions about Bennett's future in Chicago even though he has ranked among the league's most productive tight ends the past three seasons. He is third in receptions (208), tied for fifth in yards receiving (2,114) and tied for eighth in touchdown catches (14) during that time. Bennett has 348 career receptions for 3,586 yards and 23 touchdowns with Dallas (2008-11), the N.Y. Giants (2012) and Chicago (2013-15). Housler has 106 receptions for 1,139 yards and one touchdown with Arizona (2011-14) and Cleveland (2015).